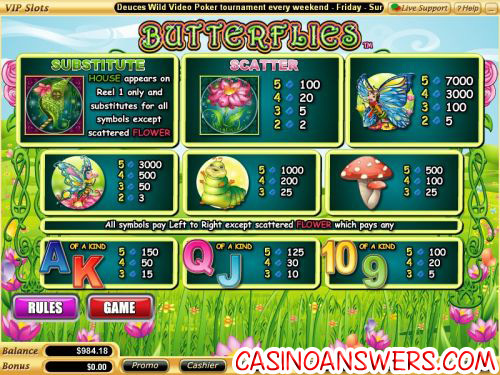 Butterflies Video Slot Guide & Review - Casino Answers! Butterflies is a 5-reel, 25-line video slot developed by Vegas Technology, featuring scatter wins, wild substitutes and more. 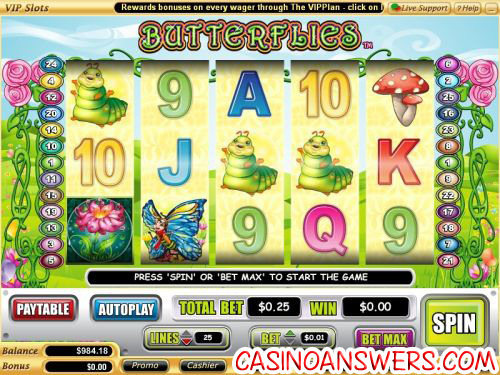 You can play the Butterflies video slot at US-friendly online casinos Millionaire Casino and Crazy Slots Casino. To start playing Butterflies, you must first set your bet per line. Available wagers are $0.01, $0.05, $0.25, $0.50, $1, $5 and $10 per line. You can bet as little as a penny and as much as $250 on the Butterflies slot machine. Also, if you choose to decrease your number of active paylines from 25, you can do so by hitting the arrows next to the “Lines” box. To play all 25 paylines, use the “Bet Max” button. To play Butterflies using the current values you have set up, hit the “Spin” button at the bottom right. The wild substitute symbol in Butterflies is the House symbol (or cocoon). It only appears on the first reel and substitutes for all symbols except for the Scattered Flower symbol. The top jackpot on the Butterflies video slot is 7000 coins. The second highest is 3000 coins. All symbols in Butterflies pay left to right except the Scattered Flower symbol, which pays any. Payline wins are multiplied by the amount staked per payline. Scatter wins are multiplied by the total amount staked, then added to payline wins. Only the highest win per active payline will be paid out. Coinciding wins on different paylines will be added. All wins occur on active paylines only except for the Scattered Flower symbol. All symbols pay left to right only except for the Scattered Flower symbol, which pays any. Open up Butterflies’ autoplay mode by clicking the button the says “Autoplay.” In the autoplay mode, you can set the number of spins (5, 10, 25, 50, 100, 250 or 500), the number of seconds between spins (0.25, 0.50, 1, 1.50 or 2), to stop once all spins have been completed, to stop if a win exceeds or equals ($50, $100, $150, $200 or $250), to stop on any win, to stop if credits are increased by ($50, $100, $150, $200 or $250) or to stop if credits are decreased by ($50, $100, $150, $200 or $250). You may cancel the autoplay mode at any time. Get a 100% signup bonus on your first three deposits and get up to $5,000 free to play the Butterflies video slot and many more great games at Millionaire Casino. Are American players able to play the Butterflies slot? Yes, Americans can play Butterflies at any Vegas Tech casino, including two of our favourites Millionaire Casino and Crazy Slots Casino. Do I need to download any software to play Butterflies? Millionaire Casino, you can download their software or play their instant play flash casino. If you don’t have Flash installed on your computer or you have any problems playing the Butterflies Flash video slot, you can download the newest version of Adobe Flash Player. Are there any special features on the Butterflies video slot? Yes, whenever House symbol appears on the first reel, a butterfly will appear and convert symbols into wild symbols. This will potentially create new winning combinations and in turn, more winnings. What is a great slot for a woman to play? What slots are targeted towards females? What is the best slot machine for a girl?